Rising ocean temperatures may result in worldwide change for shallow reef ecosystems, according to research published yesterday in Science Advances. The study, based on thousands of surveys carried out by volunteer scuba divers, gives new insights into the relationship of fish numbers to water temperatures – suggesting that warmer oceans may drive fish to significantly expand their habitat, displacing other sea creatures. The study draws from Reef Life Survey, a 10-year citizen science project that trains volunteer scuba divers to survey marine plants and animals. Over the past ten years, more than 200 divers have surveyed 2,406 ocean sites in 44 countries, creating a uniquely comprehensive data set on ocean life. Reef Life Survey takes volunteers on surveying expeditions at hard-to-reach coral reefs around the world. Lead author Professor Graham Edgar, who founded Reef Life Survey, said the unprecedented scope of their survey allowed them to investigate global patterns in marine life. The abundance of life in warm regions (such as tropical rainforests and coral reefs) has long intrigued naturalists. At least 30 theories have been put forward, but most studies have been based on relatively limited surveys restricted to a single continent or group of species. 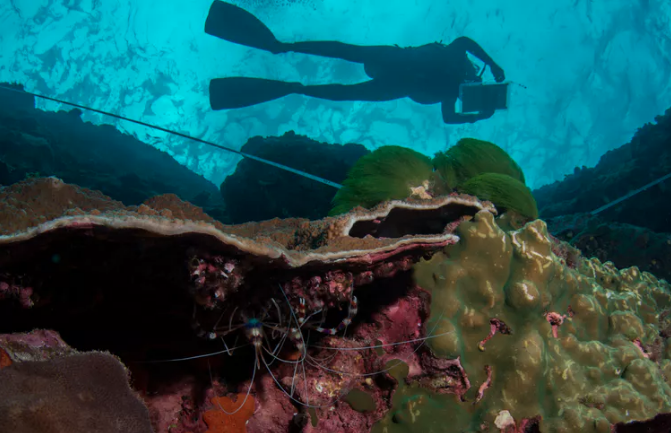 By tapping into the recreational scuba diving community, Reef Life Survey has vastly increased the amount of information researchers have to work with. Professor Edgar and his colleagues provide one-on-one training to volunteers, teaching them how to carry out comprehensive scans of plants and animals in specific areas. Dr Adriana Vergés, a researcher at the University of New South Wales specialising in the impact of climate change on ocean ecosystems, said that the Reef Life Survey has already substantially improved our understanding of the marine environment. “For example, Reef Life Survey data has greatly contributed to our understanding of the factors that determine the effectiveness of effectiveness of marine-protected areas worldwide. The team have made all their data publicly available and more and more research is increasingly making use of it to answer research questions,” she said. Some of the divers have been working with Reef Life Survey for a decade, although others participate when they can. One volunteer, according to Professor Edgar, was so inspired by the project that he began a doctorate in marine biology (he graduated this year). There’s a strong link between fish numbers and water warmth, which means warming oceans are likely to change global fish distribution. One of the important insights delivered by the Reef Life Survey datatbase is the relationship between water temperature and the ratio of fish to invertebrates in an ecosystem. Essentially, the warmer the water, the more fish. Conversely, colder waters contain more invertebrates like lobster, crabs and shrimp. Professor Stewart Frusher, director of the Centre for Marine Socioecology at the University of Tasmania (and a former colleague of Professor Edgar) told The Conversation that he believes we will see wide-scale changes in fish distribution as climate change warms the oceans. “Species are moving into either deeper water or towards the poles. We also know that not all species are moving at the same rate, and thus new mixtures of ecosystems will occur, with the fast-moving species of one ecosystem mixing with the slower moving of another,” he said. As species migrate or expand into newly warmed waters, according to Professor Frusher, they will compete with and prey on the species already living in that area. And while it’s uncertain exactly how disruptive this will be, we do know that small ecosystem changes can rapidly lead to larger-scale impacts. In order to predict and manage these global changes, scientists need reliable and detailed world-wide data. Professor Frusher said that, with research funding declining, scientists do not have the resources to monitor at the scales required. “Well-developed citizen science programs fill an important niche for improving our understanding of how the earth is responding to change,” he said.